Identity-based non-interactive key distribution (ID-NIKD) is a cryptographic primitive that enables two users to establish a common secret key without exchanging messages. All users of the system have access to public system parameters and a private key, obtained through the help of a trusted key generation center. In this contribution, we discuss how to capture an intuitive form of forward security for ID-NIKD schemes in a security model. Building on results of Sakai et al. as well as of Paterson and Srinivasan, we discuss how the proposed notion of forward security can be achieved in the random oracle model, using a Bilinear Diffie-Hellman assumption in combination with a forward-secure pseudorandom bit generator. We also show how a forward-secure ID-NIKD scheme can be used to realize forward-secure identity-based encryption. 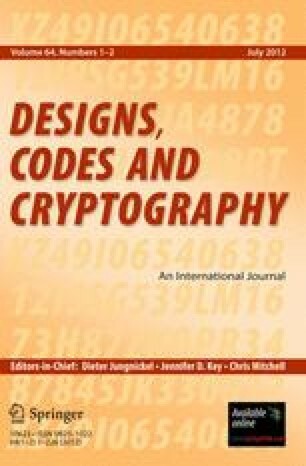 This is one of several papers published together in Designs, Codes and Cryptography on the special topic: “Geometry, Combinatorial Designs & Cryptology”.